Every drop of Comfort Intense Fresh Sky fabric conditioner is ultra-concentrated and designed to release intense freshness from every drop. Because it is ultra-concentrated this brings great environmental benefits, saving 34% plastic, releasing 24% less waste and 20% less greenhouse gases compared to Comfort Blue Skies. A superior clothes care conditioner that will leave your clothes looking, feeling and smelling like never before. Use this laundry conditioner with laundry detergent to help preserve fabric colour and softness. Look after your clothes and the environment with this soft Clothes Conditioner and its small bottle made of 100% recycled plastic. Just add half a cap to each wash and unleash the positive power of your clothes. Your clothes have the power to change how you feel, so it?s important to give them the best possible life. With this Comfort fabric softener your clothes will look, smell, and feel incredible wash after wash. Be whisked away on an epic journey when you add one half a cap of this Comfort conditioner to your laundry. Inspired by the great outdoors, this ultra-concentrated fabric conditioner contains Comfort?s special technology that releases long-lasting fragrance. With the fragrance of fruits, flowers, and a hint of wood for an extra-fresh smell, you won?t be able to stop loving your clothes with the Comfort Intense range! Comfort believes in the positive power of clothes ? let Comfort fabric conditioner make them last longer and stay bright and soft. Using Comfort Intense fabric conditioner regularly helps keep the shape, texture, and colour of your clothes, making the ironing easier. 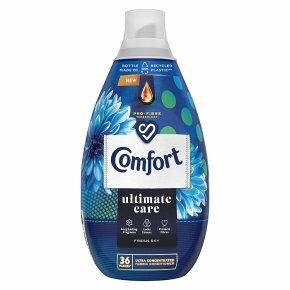 And now with a more sustainable pack, as each bottle of this ultra-concentrated Comfort fabric softener is made of 100% recycled plastic, it will help you go green too! To use this Comfort softener, pour half a cap into the fabric conditioner compartment of your washing machine drawer. Run your washing machine on its normal cycle and wait for the magic to happen as the fabric softener scents are released. For best results and long-lasting clothes, use this superior Comfort fabric conditioner alongside your favourite laundry detergent. Never add Comfort liquid directly to your clothes.